NOTE: Several of our larger customers, including Fannie Mae and Wells Fargo have negotiated special discounts for their vendors. If you are doing work for a large customer, please contact your National Vendor for your discount information. How Much Does Vandalism Really Cost? Whether you are renting or flipping properties, a single vandalism on a property will cost you thousands of dollars and months of additional work. Whole house bundle comes with 1 Door Armor MAX and 3 Door Armor MINI kits. Meets Fannie Mae requirements. Bundle comes with 4 Door Armor MINI Combo Sets. Recommended for larger portfolios. Prevent's kick-ins. Bundle comes with 4 Door Armor MAX Combo Sets. Recommended for maximum security. Prevent's kick-ins and protects hinges. We know what you are going through. In 2004, we were renovating properties when we found out just how much vandalism costs. Since then, we have made it our mission to protect families and properties. We guarantee our products because we want you to know that we are in this with you. Insurance companies are starting to offer discounts to investors that use Door Armor to secure their portfolios. Insurance companies understand that properly securing your properties will cost them, and you, a lot less in the long run. OSC Insurance is one company that is offering a discount of up to 10%. Ask your insurance company if they offer a similar discount or contact OSC to see if they can save you some money. In 2004, we were renovating properties when thieves kept kicking in our doors. It cost us a small fortune. After nothing else worked, we developed our own solutions to keep the bad guys out. 13 years, and more than 250,000 secured doors, later we have seen and heard more stories about break-ins and attempted break-ins than we can remember. Every one of them brings us back to the feeling of vulnerability and helplessness we had walking into our vandalized homes. Had we not needed to solve a problem that was costing us REAL money, we would not be here today. If you are here, you are either scared or are trying to solve a problem. Failure is not an option when someone is threatening your family or your investment. We stand behind our products because we understand how it feels to be victims. 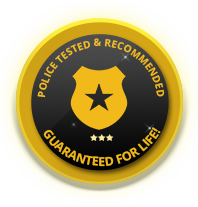 We offer unmatched guarantees on our products because we want you to understand that we are in this together. Over time we have developed different variations of our products. These variations have all been in response to customers wanting something easier to install, less expensive or in a different color. Thank you to everyone that has given us feedback over the years. We believe that listening to customer feedback that has made our company unique and will continue to drive us going forward. How Can Armor Concepts Help Your Business? Apartment owners, homeowners, and other single family rental owners all need protection. We promise that we will never cost you more than we save you. We also have an affiliate progrem where brokers, and others, can earn money by referring us to friends or other business associates. Increase your profit and protect your properties with the best home security solutions available. Q: Where else can I buy Door Armor? A: While you won't be able to find the MINI or different colors, Door Armor is available on Amazon.com, and at Lowe's and Menards stores across the country. ​Q: Can Contractors get reimbursed for using this? A: Door Armor is required by fannie Fannie Mae and is approved for use by Wells Fargo, US Bank, or HUD to secure their properties. You will be reimbursed according to their policy. In the unlikely event that you have any difficulty, please let us know and we will make sure you that you are taken care of. Q: What if I service properties in Puerto Rico, Alaska or Hawaii? A: While we don't ship to Alaska, Hawaii or Puerto Rico, if you live in one of these areas, please contact us for for ordering options and discounts available on Amazon.com. Q: Will it fit all of the doors on my house? A: We only show a few products on this page. We have solutions for every kind of door, including sliding glass doors. Look at the "Shop Now" section in the main menu to see our solutions for different kinds of doors. Door Armor is simple to install. The video below was done by a customer. If you want to see additional installation videos, please visit our Installation Page. Note: In this video, the installer pre-drills every hole. While that is recommended, Door Armor comes with self-tapping screws and does not require pre-drilling. Using an impact driver for your screws will also make installation easier. If you are installing the MINI kit, you simply replace two screws in each hinge, instead of installing the Hinge Shields.